In modern ecosystems, it's quite easy to establish ecological interactions between predators, prey, and plants – we simply have to look at who is eating who or what. But in the fossil record, this is quite difficult, as the animals we look at often tend to be dead. The discovery was of a new dinosaur species, called Isaberrysaura mollensis, and it comes from one of the major dinosaur groups called Ornithischia – the bird-hipped lizards (ironically, not the dinosaur lineage that led to birds, but that's another story). The 5-6 metre long herbivore inhabited the deltas of Argentina, now the Neuquén Province, back in the early part of the Jurassic. The seeds have been permineralised, which means replaced by hard minerals that allowed their preservation over millions of years. 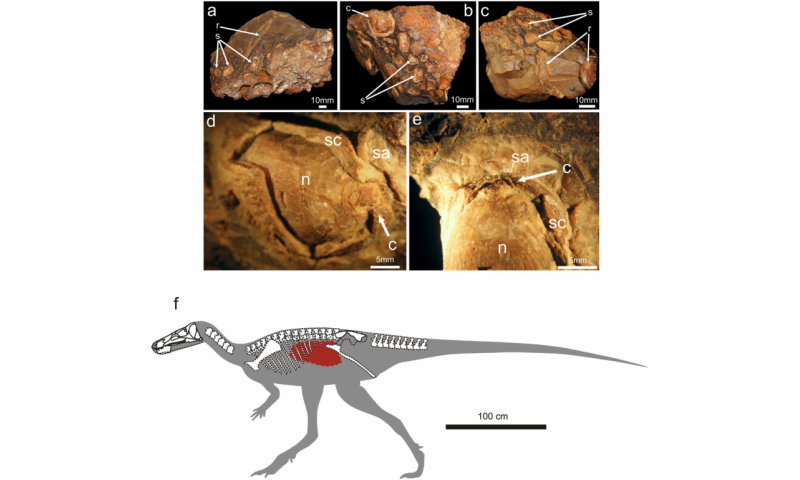 Some of the seeds were still largely complete too, which suggests the hungry little dinosaur gobbled them down (is this the first time "gobbled" has ever been used in a dinosaur research paper? ), instead of taking the time to chew them. These toughened seeds probably would have passed through the digestive tracts of the dinosaur, to be 'expelled' as seed kernels, meaning they would still have been capable of germination. The teeth of Isaberrysaura seem to have been quite poor at food processing, especially compared to their later hadrosaur cousins and their immense 'dental batteries' for grinding plant matter into oblivion, which helps to explain why the seeds are preserved in such good condition. This is interesting, as it shows that some dinosaurs, much like modern mammals, might have been important in helping to disperse the seeds of plants along landscapes through plants' ingenuity of exploiting the fact that dinosaurs like to poop from time to time.